As scuba divers, have you ever been bitten by a fish or other marine life? Naturally when interacting with animals, marine or land based, there will be occasions where biting incidents occur. It is natural. However, there are cases when such actions might be warranted. Why is he playing with this fish? For a Photo-op? diver jerk offs like that deserve everything they get. interacting with wild animals ends like that. try just looking and not petting the fish, you idiot. Are you seriously that paranoid? Interacting with wild life is humanly. Get a life! And stop your hypocritic mocking, you must have interacted some day. 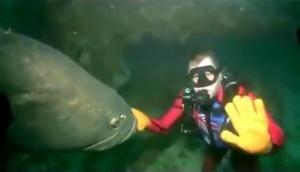 His motions to the camera operator riled the grouper, IMHO. Not that I think he should have been handling it. Maybe the grouper thought he was a cleaner, but got spooked by those gestures. Groupers of all sizes are attracted to the color yellow. This diver is wearing yellow gloves. The grouper went after them. No surprise here. Here’s what really happened. 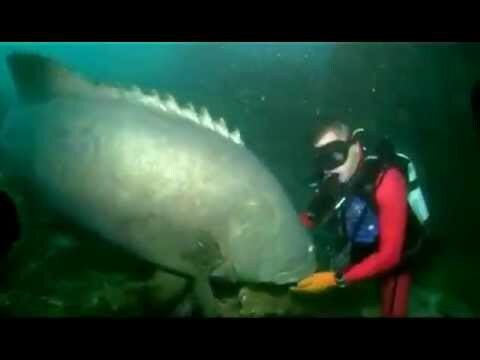 That’s a Jewfish, sorry ‘Goliath Grouper’ for you pc folks. This diver is a guide, and he feeds this fish every time he brings a group out. This time, he was a little slow with the treats, so the fish helped himself to the treat bag on the diver’s BC. Yet another stupid diver who cannot comprehend the simply rules. Do not feed the fish and do not touch the fish, Being a guide he should know better. When diving the Red Sea while working in Saudi Arabia, we jokingly referred to a large one near a favorite wreck as a “Palestine Fish”, because of the Kingdom’s denial of the existence of Israel.